1) Jump and squee with joy if I am selected. 5) Pray that it does not look too awkward hanging 2.5" off the sides of my 30" entertainment setup. 6) Get it all set up and hooked up to my TV and Bluray player. 7) Stroke it lovingly, telling it how awesome and pretty it is. 9) Try out some Bluray movies, like Star Trek, or Arrow, and perhaps Spaceballs and/or He-Man. 11) Be grateful that I caught this opportunity to possibly be able to test out such an awesome piece of technology days before the deadline! 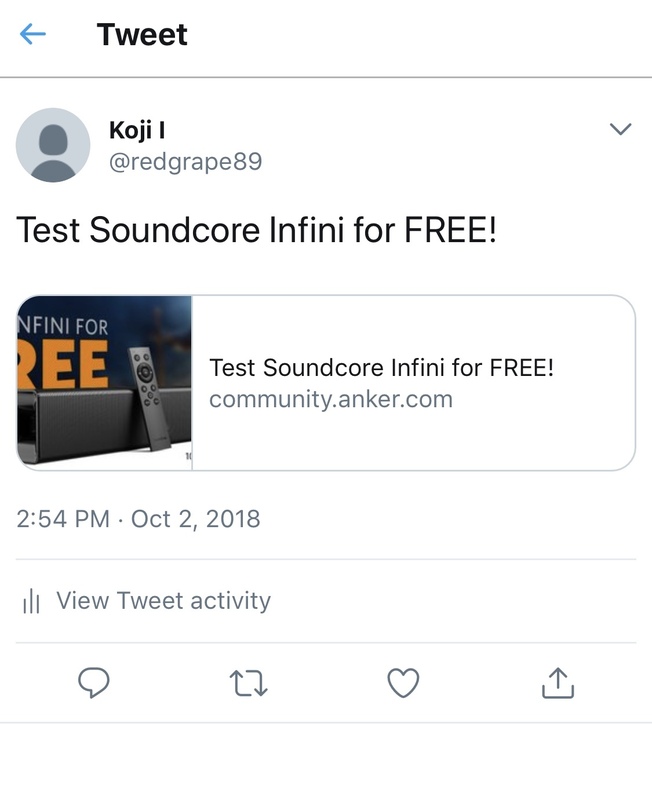 12) Pray that I and the other nine testers get to keep the Soundcore Infini. Our Podcast does retro reviews of movies and TV shows as compared to their remakes and reboots! www.40go14.com is where it's at! For this product we would completely love to have the unboxing and show off the product at the start, including the so sweet peeling of the protective stickers and reading of the specs of the product. Hooking it up! Getting it all set to work with the TV, lined up in the room and set up correctly so that we get the best sound possible. Then using it for our retro review! Choosing a movie with amazing sound, music and effects so we can completely absorb what we're watching, then doing it again with the remake/reboot for the show! We'd share the review out to our podcast, and to our Facebook page where we interact with our fans! While this would be an audio review in the podcast format, the unboxing and use of the speaker would be posted on FB live (and to Instagram) for our listeners and followers to see and comment as we're doing it! October is a great month for this also, since we're going to be watching horror movies and their remakes all month! My review will be after knowing all the spec and features of the system. The review will be honest and will be given a descriptive review with photos. My name is Aaron Leong and I run a YouTube channel called GearUP-Go!, based here in Bay Area, California, in which one of its focus is tech gear. I produce detailed, honest reviews (peppered with some humor) primarily on a gear's livability, i.e. how good is it day-to-day and long term, how much it costs the average person, ergonomics, etc. Unboxing and setup, followed by detailed test on audio quality, aesthetics, ergonomics. Crazy idea #1: Mount it in the back of my cars, to see how the Infini could work as a superior ICE speaker. Crazy idea #2: Mount over kitchen counter cabinets to replace Google Home sound. My workflow is as follows: I spend 2-3 weeks with a product (preferably a month of more).This allows me enough time to look over and test everything. With my notes, I will then shoot A- and B-rolls. I take another 5-6 days to post-produce, edit, and publish to YouTube. My background: Production engineer; Learning and Development Designer; YouTube hobbyist. My channel's target audience are gearheads, techies, outdoor people, and are usually also any combination of these things. Thanks in advance for your consideration, Anker! 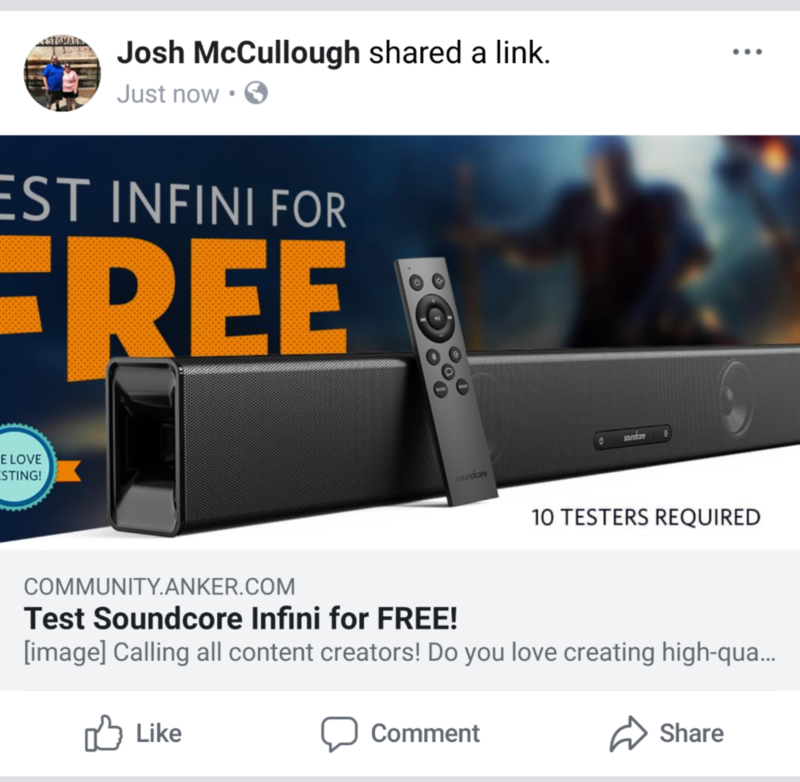 I would love to test this Soundcore Infini. Compare with my Infini mini on the exterior and sound. Connect it to my TV using optical link and test sound for both music, TV and films. Connect it to my Amazon Echo dot using bluetooth to test the connection and sound quality. Connect it using the AUX cable to an old phone to test sound purity. Thousands of views in several videos, Thousands of subscribers. Tech, gaming and more! https://m-uk.gearbest.com/?lkid=15856615 Contact me via direct message, I’ll reply to you as soon as possible! Your TV sounds rubbish. And it’s not just yours – TVs have generally sounded terrible ever since they got prettier – and thinner. No longer is there any room for beefy audio components. Big speakers would be a great help, but not everyone wants or has space for those. The solution: soundbars, which exist to lend your TV some much-needed sonic support. They’re a neat and cost-effective way to improve your sound without the hassle (and cables) of a traditional surround sound system. There are quite a few varieties, though. You can get a basic standalone soundbar, a more advanced soundbar with a subwoofer and the potential to add satellite speakers, or a soundbase that your TV sits on. 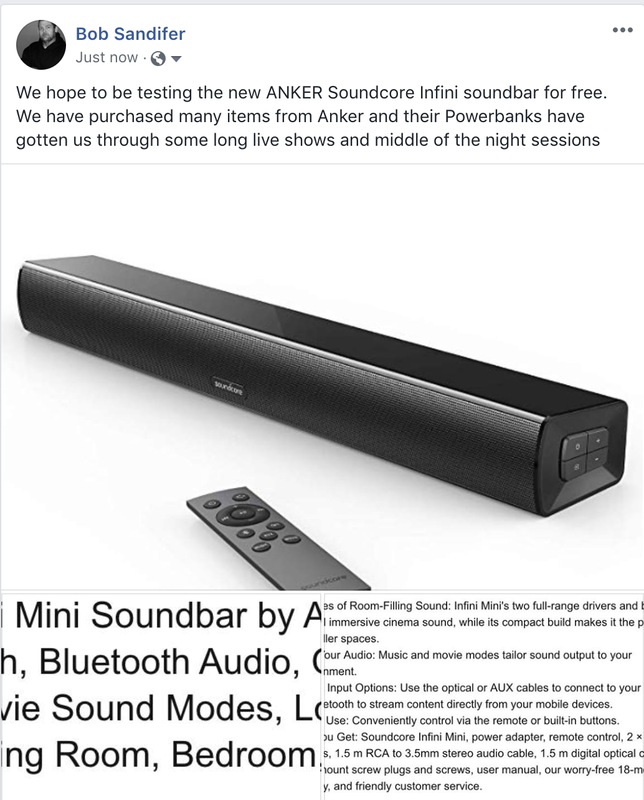 I’m quite excited about the upcoming Anker Infiniti Soundbar. Soundbars were invented to make your TV sound better, which means we end up watching a lot of TV. The Anker Infiniti is the best out right now. -I will do an unboxing + easy setup/installation tutorial video and also an in-depth review going through all the pros and great things about this soundbar and what makes it innovative and unique. -Why you should buy it and what makes this soundbar special to all the others on the market. -Why their isn’t anything to worry about and what it’s designed for? Thank you for reading this Anker. If I’m picked, be sure to expect the highest quality videos and review and also professionalism and personality in the videos to really engage and appeal to a wide audience. I own a recording studio and our clients are always looking for new and better ways to listen to their music. We have a producers lounge where most of my clients end up at some point and this could be anyone from Luke Bryan to The Ying Yang Twins. I plane on doing a full unboxing and initial setup in the actual control room where we would discuss the company as a whole, build quality and the overall sound compared to the current array of monitors we offer. After this we will install it in our producers lounge with interviews from our clients concerning the overall sound quality, price and design. After the initial testing we will place it our families listening environment and produce another video that will feature daily family use compared to our current home stereo speakers which we would consider about middle of the road in design, price and sound quality. We can supply followups with more artist reviews regularly. 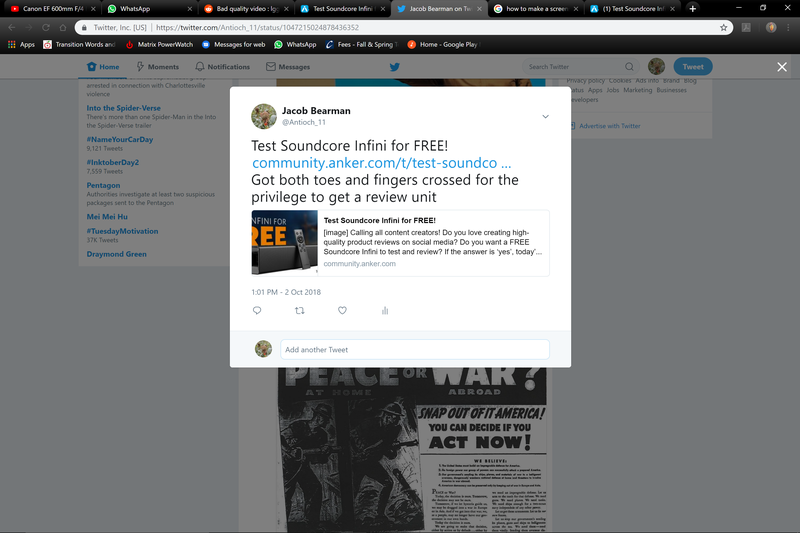 Our newsletter has over 9000 subscribers which are all music professionals and artist that is sent a minimum of twice per week that offers featured products and all of our social media has well over 10,000 friends and likes. I currently own a DTS-enabled Samsung soundbar with a wireless sub. I am not 100% satisfied with it. I will hope Anker will be a better product and I will write a comparison between that and the Anker. 1. Doing an unboxing video with initial impressions and specs. 2. Do a video on how to set the soundbar up and how to change the settings for the best experience. Do another video on the information and specs but more in depth and compare to other speaker bars. I would love to review this product on YouTube and share lot across all social media accounts. I would do two videos one unboxing and showing off the hardware and the second giving my actual opinions on the product after use. I will review audio quality, build quality, I would also test out and review ease of use. I would test out with movies and sports even cartoons to get the full scope of this product. In the video along side footage of the device I will include extra pictures showing off the device looks. The reason I want to product test this, is because I have 4 different TV brands with different sizes n sound quality. Also I have 3 different brands of sound bars which I will be comparing against. JBL, Bose n vizio. Plus I have 4 different Bluetooth devices to send the original to this speaker thru. Step 1, Photo and video unboxing, with comments. I can give a plainly spoken written review with photos. I am not a professional reviewer, just a regular consumer. I will make every effort to shed light on any good product points I observe and will give my honest views. I've reviewed headphones, software, and other consumer electronics. I would first show the unboxing and explain the preliminary setup process, then make comments on how that went. 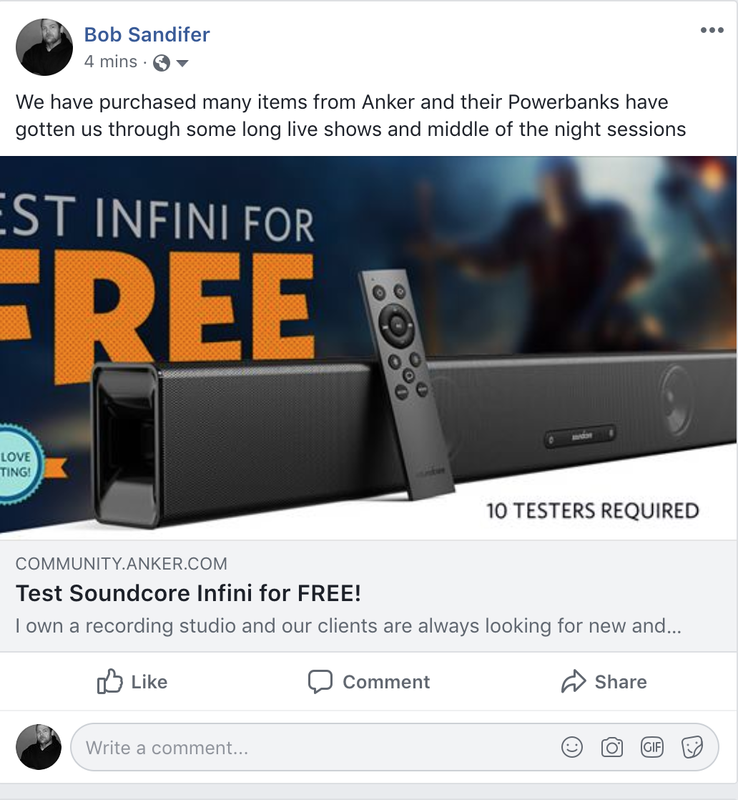 Then, would be the sound test using smartphones, my Sony TV, a surfacebook 2 with dolby atmos enhancements all though wired connection. 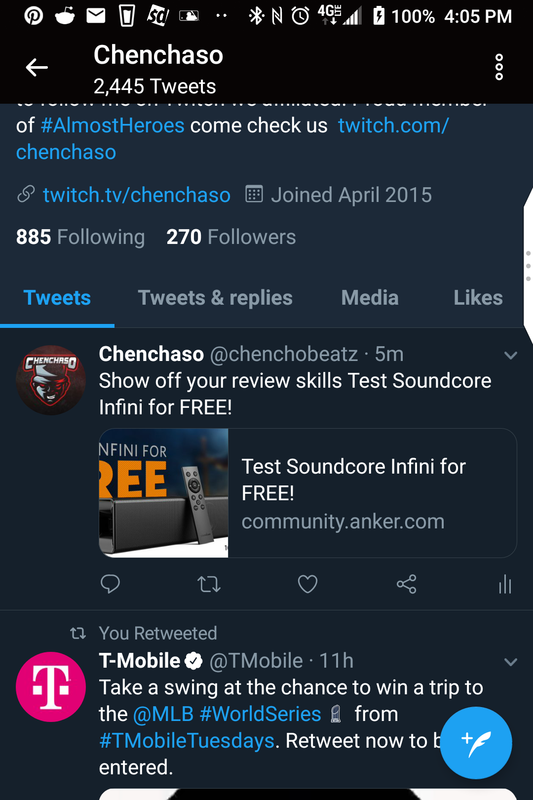 For that test I would play a variety of different genres of music to test the frequency response, bass accuracy, and other key requirements for a good speaker. 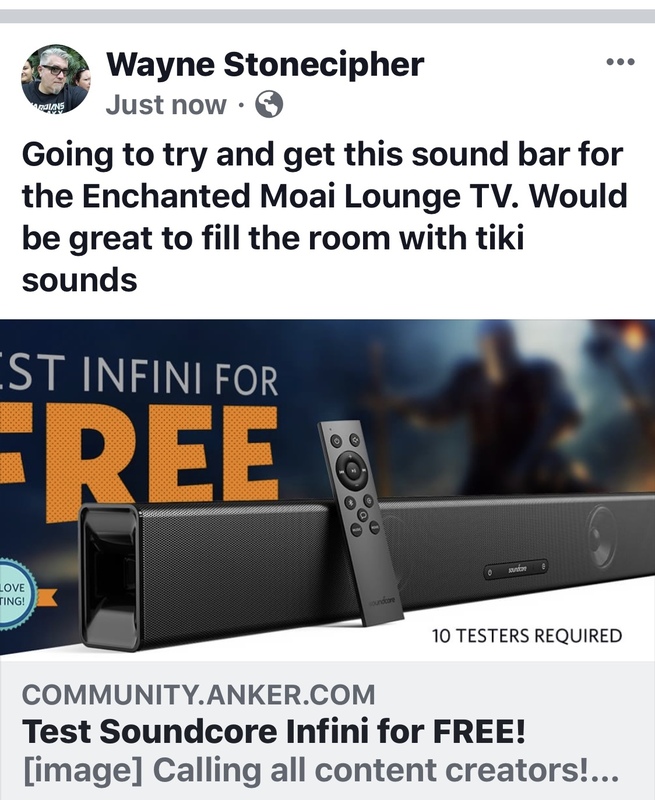 I will also be critiquing the build quality of the device, as many people chose a soundbar for not only, well the sound, but also for it's looks. I can make the 2 week review time frame. I have been a long time user of anker products if that make any impact. I have a large room with a 24' ceiling. Sound is horrible for watching TV. 1)see the range this can go for various shows. 3) how the sound carries in the room vs an older 6 speaker surround sound system. 4) how easy it integrates into the room and system set up. I plan to take pictures. I plan to connect this with my phone and listen to my favorite YouTube channels all day. I plan to hook this into my TV, order pizza and tip the delivery guy generously just cuz. I plan to invite my friends over and have a karaoke party using this speaker. I have always loved Anker and whenever it comes to my sound or power needs Anker never fails me. 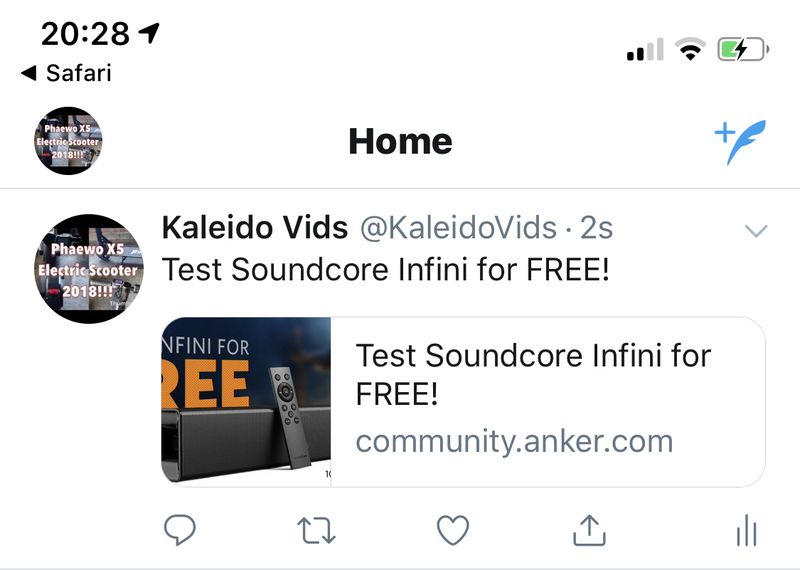 I would love to test this new Infini and create a YouTube review for it. 8. )Test with: Netflix, Hulu, Amazon Prime Video, Amazon music(different genres of music), Xbox One, and Playstation 4. 9.) Give conclusion, rating, and recommendation if one is fit. Too Many Hoops these days just to fail and being picked. Hell of an advertising gain they get from this.